Joe Rogers, whose “Dream Alive” program recognizes the contributions of Martin Luther King, Jr. and other civil rights leaders, will speak at Sam Houston State University on Feb. 9 in the Lowman Student Center Theater at 2 p.m. His presentation is one of several events that will take place in honor of Black History Month. The purpose of “Dream Alive” is to give people the chance to see what the civil rights movement was really like, according to Ashley McDonough, program coordinator for the Office of Multicultural and International Student Services. 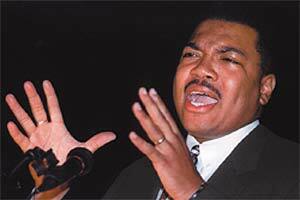 Rogers reenacts famous speeches by Martin Luther King, Jr. and speeches that recognize the civil rights movement. Rogers is a recipient of the Time Warner’s Turner Broadcasting System Trumpet Award, one of the nation’s highest privileges in acknowledgment of African Americans. He has served as America’s youngest lieutenant governor (Colorado) and is only the fourth African American in U.S. history to be elected as a state’s No. 2 executive. Rogers is also a national speaker, lecturer and attorney in Colorado. For more information, contact the Office of Multicultural and International Student Services at 936.294.3588.